One of the biggest differences between the U.S. and Italy is how long the holiday period lasts. In Italy, the holiday season kicks off on December 8 with the Feast of the Immaculate Conception (“L'Immacolata Concezione” in Italian) and lasts until the Epiphany on January 6th. While the Immaculate Conception is of course a religious based holiday, it is also a national holiday in which government offices, schools, and most businesses are closed. Even those who do not attend church regularly often commemorate the holiday in some way. From a more commercial standpoint, December 8 marks the beginning of the Christmas shopping season, where stores are packed with holiday shoppers, and many families put up their Christmas tree. The next major holiday event, as in the states, is Christmas Eve or “La Vigilia, which can be translated to The Vigil. Some may have heard of the “Feast of the Seven Fishes,” a Christmas Eve meal in which seven different courses of fish are served. While it turns out this is largely an Italian-American practice found mostly in the U.S., many Italians do eat a fish based meal on December 24. Unlike its counterpart in the states, there is not a set number of dishes, rather certain customary plates are served. The meal usually starts with several appetizers or antipasti, including Baccala or salted cod fish or some type of shellfish. Then, as in all traditional Italian meals, a pasta dish is served. On Christmas Eve this often means spaghetti con vongole, or spaghetti with fresh clam sauce. Depending on the household, there are often multiple other pasta dishes served. The second course is also fish based, and may include octopus, calamari, shrimp, cod, mussels, clams, cuttlefish and more. As one can see, there is a strong tradition of eating fish on Christmas Eve in Italy. 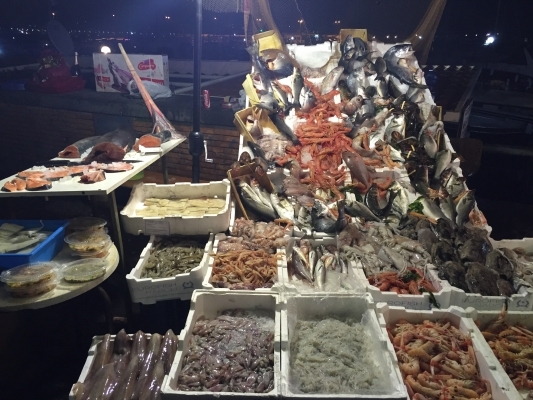 In fact, fish vendors in many seaside towns begin to sell fish at midnight on December 23. These fish vendors stay open all night selling freshly caught seafood and traditional fare you only see during the holiday season, such as eel. Italian tradition dictates that eating eel on the night before Christmas is good luck. Many traditional Italian households prepare a dish of fried eel to be eaten during the holiday meal. The holiday season continues of course with Christmas Day, which like in many countries is all about family and food. The holiday period in Italy lasts through the New Year, up until the Feast of the Epiphany which marks the 12th day of Christmas. This celebration, on January 6th, corresponds the day in which the Three Wise Men brought gifts to baby Jesus. “La Befana” can be though of as the friendly witch of Christmas, riding on her broom stick to deliver candy and small treats to children. As we can see, the holiday season in Italy has its own particular customs, but in many ways is similar to holiday norms that revolve around food and family. In general, Italy has more nationally celebrated holidays than the United States, and depending on the time of year of your travel, you may be able to partake!